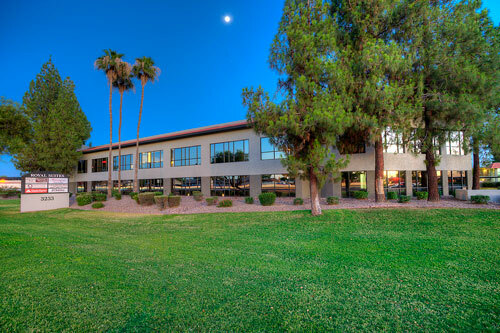 Phoenix, Ariz. (October 25, 2018) - Royal Suites Park, a two-story, 29,462 square foot office building located at 3233 West Peoria Avenue in Phoenix, Arizona, has sold for $2,050,000 to Page Holdings, LLC, an investment group. Kidder Mathews commercial real estate broker, Jenette Bennett, CCIM, represented Page Holdings, LLC in the transaction. The seller was Viel Gluck, LP and Far Marel, LLC. "Property owners in Phoenix are being realistic and ready to make deals understanding there will be a significant undertaking to improve and reposition their properties. When they decide to sell value-add assets in their portfolios, it's often due to deal fatigue or distance from the property. New owners with fresh energy and resources then have an opportunity to invest in and improve the buildings," said Bennett. Kidder Mathews is the largest independently owned commercial real estate firm on the West Coast, with over 700 real estate professionals and staff in 21 offices in Washington, Oregon, California, Nevada, and Arizona. Kidder Mathews offers a complete range of brokerage, appraisal, property management, consulting, project & construction management, and debt & equity finance services for all property types. The firm performs $7 billion in transactions, manages over 50 million square feet of space, and conducts 1,500 appraisals annually. For more information, visit kiddermathews.com.